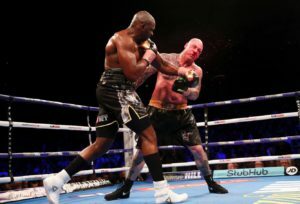 Dillian ‘The Body Snatcher’ Whyte sent a cold message to the rest of the heavyweight scene with a savage one punch knockout of unbeaten Australian, Lucas Browne at London’s O2 Arena. It was a tentative start from the first bell even as Browne developed a cut late in the round on his left eye. Whyte took over from thereafter though with the cleaner, more precise punching. Browne seemed to be without a game plan, plodding forwards without any obvious intent and no sign of the power he promised to bring pre-fight. Into the 5th round Whyte was firmly on top, working behind the jab to pick at the cut on Browne’s eye and by now, his busted nose. Then in the 6th round, Whyte fired off a brutal left hook which sent Browne, face first onto the canvas. Without little hesitation the referee waved it off and Whyte’s celebration became slightly muted as the medics rushed into the ring. Thankfully, Browne got to his feet and the attention could turn back once again to the victor, in Dillian Whyte, now 23-1 (17KOs) and his future. The WBC silver champion will now turn his attention firmly to the current titlists, either WBC champion Deontay Wilder or the winner of next week’s unification showdown between WBA & IBF champ, Anthony Joshua and WBO holder, Joseph Parker in Cardiff. Commonwealth light heavyweight champion Callum ‘The One’ Johnson scored the biggest surprise of the night when he stopped British champion, Frank Buglioni in the 1st round. Johnson, 17-0 (12KOs), coming off an 18-month injury layoff, came out firing and once one landed, Buglioni couldn’t do enough to keep the challenger for the Lonsdale belt off him. Callum had already knocked Buglioni down once before he sent his foe sprawling backwards again on unsure legs and the referee called an end to the fight just before, Buglioni’s trainer, Don Charles threw in the towel. The win blows the British light heavyweight scene wide open now with most of the talk before tonight’s bout being about who Frank face next; Now it’s all about where Callum goes from here with the likes of Anthony Yarde, Bob Ajisafe and even fellow gym mate, Hosea Burton pining for a chance at the British. With the British lightweight belt on the line, Lewis ‘Sandman’ Ritson faced off against the former British champion, Scott Cardle in the ‘Sandman’s’ second defence. After an impressive all-action 1st round from the challenger, Ritson proved the more ruthless and efficient of the two men. Taking a more composed approach to the 2nd; working behind a strong jab, the champion landed a heavy left hook that left Cardle staggering backwards into the ropes forcing the referee to give Scott an 8-count. Ritson then put his foot down, landing power shot after power shot until Cardle’s corner threw in the towel. Highly rated welterweight prospect, Chris Kongo endured 6 difficult rounds with Serge Ambomo to move to 8-0 (6KOs) after picking up 60-55 victory. Ambomo, now 6-6 (2KOs) is, as Carl Froch put it in commentary, part of the ‘Who needs ‘em club?’ and although it wasn’t pretty, Kongo will have learnt a great deal, along the way to picking up another win. And finally, Anthony Fowler scored a very dubious 5th round stoppage of unbeaten Frenchman, Kalilou Dembele to move to 5-0 (4KOs). Dembele was down in the 2nd and then again in the 5th but seemed perfectly capable of carrying on before referee, Bob Williams waved it off, despite protests from Kalilou. Fowler will be out again next month on the Khan vs Lo Greco card in Liverpool against an unnamed opponent.